My last day of work before the New Year’s break had Munky emailing me to inform me that my birthday present had been nabbed by customs. My birthday was way back in November, and I knew he was getting me something because he’d told me it was going to be late, so you can imagine that the sense of intrigue was somewhat fierce by this point. Being told that it had failed to get through customs made this even more so. Shortly after I got home Frood emailed me, subject line: “You can has claws!” I opened said email and found the following message and attachment. At this point I jumped to an over-excited conclusion. Because the man in the picture is wearing trousers very similar to the ones Frood had been wearing when he left for work and I’d received that mail from Munky explaining that my birthday present had been caught by customs, I figured that Munky had got these for me as a birthday present and sent them to Frood because he works in a postroom, Frood had taken delivery and this was a picture that a colleague had taken on his phone. Only, in my now-disappointed excitement, I failed to see the first sentence and fired back another email suggesting that perhaps all we had to do was present ID to the post office and pay the duty charges and we could get them through. Then I grabbed the phone and called Munky. Munky: Hey you! How are you? Me: Never mind that. What’s this about claws? Me: The claws! 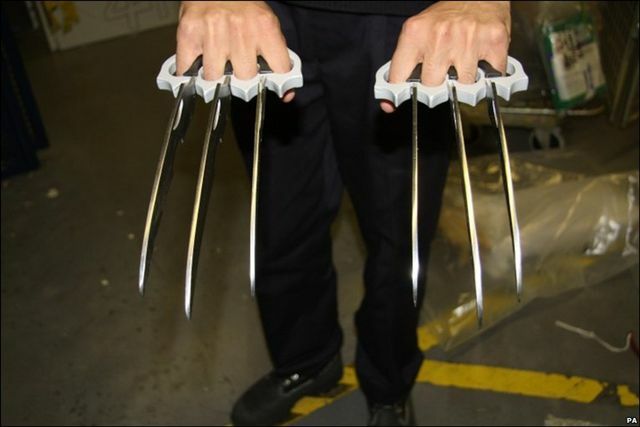 The claws stuck in customs! And then the whole sorry story came out and finally, with Munky gasping for breath in hilarity at how I had been beaten very profoundly with the coincidence stick until I’d grasped the wrong end of it and clung on like a kitten with a catnip mouse, I realised that I could not, in fact, has claws. At all. And I still don’t know what he’s getting me for my birthday.